Happy Friday! I'm in Chicago for a couple days hosting a Vionic footwear and Wallis fashion event at BlogHer. Follow me on Instagram for an inside look. I have to say, I'm already missing my pup. The pic above is from last weekend at Ocean Beach in San Francisco - and yes, those are new mirrored Ray Bans you see me wearing ;-). 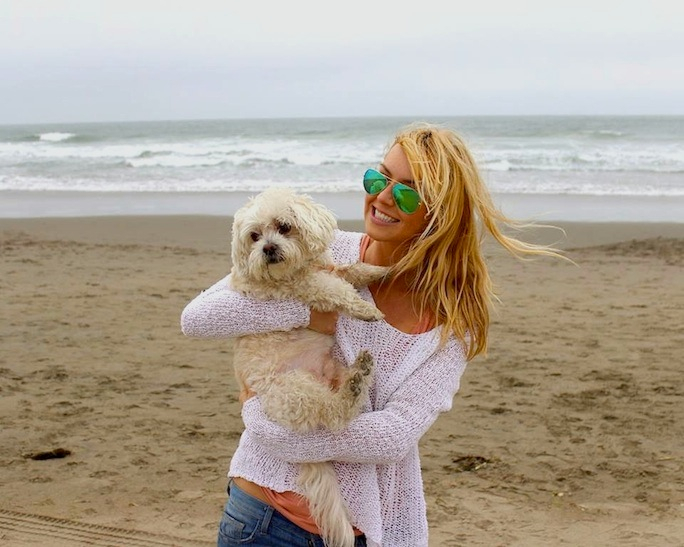 One of my favorite things in the world is to spend time with my fiancee and our dog-child, Chopper, at the beach on a cool afternoon. Give me a hot cup of coffee on top of that and I'm in heaven. I love your mirrored Ray-Bans!! I still haven't ordered them. I need to. I love your leather jacket picks also. Thanks, you should totally get them - they are great! Have fun in Chicago! I love that city! I don't blame you for missing your dog. He's adorable! Thanks! Chopper is pretty adorable and he knows it and works me! I hope that you have fun! I love those sunglasses - gorgeous! Adorable... And those sunnies! Loving them!